The Model 100 is Air-Tran's simplest system. It features a single feeder hopper that introduces parts into a positive air flow for conveying. It is an ideal system for transporting parts short to medium distances from a single pick-up point. The Model 100 has been the solution for many companies with a scrap problem. Designed to convey trim (neck, tails, moils, etc.) 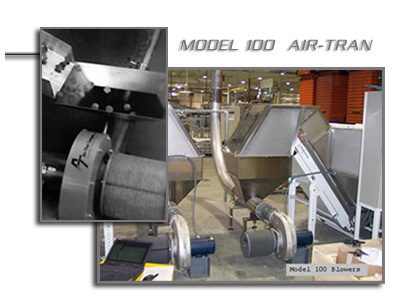 to a granulator or grinding area, the Model 100 can also transport reject bottles and molded parts. Air relief devices slow transported pieces down to gently deliver the parts to a receiving area.